How to Return your Pondmaster, E.G. danner, Prolinne, Supreme or other danner products for repair or replace options. OUTSIDE OF THE BOX YOU ARE SHIPPING TO US! THIS WILL BE YOUR AUTHORIZED (RFR) NUMBER! COULD RESULT IN THE PACKAGE BEING REFUSED! 1.) Determine if the product is still within warranty by the manufacturer or if it is no longer covered. If the unit is with-in its warranty period then you should pursue warrantee through E.G. Danner Mfg main office. Pondmaster Service is NOT responsible for warranty coverage. If your unit is no longer covered by warranty or if you have lost your proof of purchase receipt then the repairs are your responsibility. ALL warranty coverage is verified by proof of purchase documentation, without which warranty cannot be honored. 1-a) A basic determination of reparability must also be made before submitting your product for repair, for instance; If the electrical unit is tripping a G.F.I or other electrical breaker it is usually considered to be NOT REPAIRABLE, provided your GFI or breaker is not faulty. At this point, call Pondmaster Service for assistance or replacement. We also offer generous discounts to loyal Pondmaster Customers who choose to replace their product instead of attempting repair. 2.) Pondmaster Service is able to provide both O.E.M. (Original Equipment from the Manufacturer) Parts and also offers Professional Repair Services to Pondmaster products. Both Pondmaster Dealers and Pondmaster customers are served by this program. Dealers who perform repair for their customers can purchase parts or replacement product at distributor level pricing from Pondmaster Service without having to commit to a large order or meet minimums (Proof Of Dealership is Required). Those Pondmaster customers who choose to repair the product themselves can easily purchase O.E.M. parts and product at competitive prices from the Pondmaster Service web-site (pondmasterservice.com) or call 518-793-8184 - 9:30am till 5:30pm Monday thru Friday and assistance will be given for D.I.Y. customer purchases made here. 3.) ALL shipments of product to Pondmaster Service for repair MUST BE AUTHORIZED. UN-Authorized deliveries will be refused. Authorization for repair is obtained by purchasing an 'Authorized for repair TICKET' for the corresponding Pondmaster Item listed below the ticket. Once you have purchased the service TICKET for your item you must then ship the item to Pondmaster Service. This Service TICKET both authenticates your shipment and covers time and energy spent to diagnose* the problem with your item. A copy of your service TICKET receipt should be shipped along with the item and the Service Authorization order number should be plainly written on the outside of the shipping box. The (RFR) return for repair TICKET number is the order receipt number on the receipt you receive, once ticket purchase is complete). 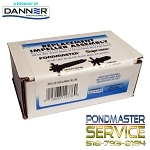 Pondmaster Service is NOT responsible for items lost or damaged in shipping. Always use a reliable carrier and adequate amounts of light-weight packaging material. 4.) Once the item is received and diagnosed* we will contact you and arrange for repair (usually within 24 to 48 hours after receipt). We will then, if agreed, charge you for the cost of replacement parts as well as the cost of shipping your item back to you via an affordable 'traceable' carrier of OUR choice. If your item is immediately, or after repair attempt deemed NOT repairable, then we will offer you a considerable discount on a suitable or identical replacement item. If you are not interested in a replacement, the item can be shipped back to you at your expense or it will be discarded. Either way your TICKET purchase price at this point is NON-Refundable. You will now have 30 days from this date to change your mind about replacement and the same considerable discounts will still apply. *'diagnosis' is actually an expert opinion based on 30 years of Pondmaster experience and not a final guarantee that the item is definitely repairable.